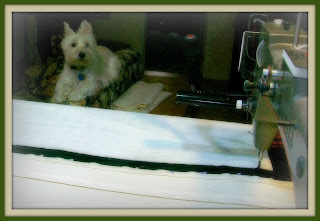 365 days of wonderful: Life is "ruff"
I get lots of company when I long arm quilt. Our 9 year old Westie " Jock" loves to sit on top of the sofa and watch. I'm at the machine most days so I guess he figures it's the best way to get some attention. He''s the type of dog that needs to be close to his family. Where ever you are, Jock is too. If I'm sitting at my sewing machine, he's at my feet. If my husband is on the computer, Jock's there too. He has a "ruff" life just lazing around all day, but he's good company.